Everyone thought Beth Ann Bennet and Dr. Will Darcy had an unexpected romance in Perfect Match. Now, Beth’s best friend, Jane Henderson, and Will’s first cousin, Bingley McNamara, begin their own unlikely love story in Perfect Bet, which starts at the Darcy/Bennet wedding when they find themselves in the roles of maid of honor and best man for the newlyweds. Pride, Prejudice and the Perfect Bet is an original Austen-inspired romantic comedy about two seemingly “very nice” people who have a little more of a dark side than they like to let on… Can these two commitment-phobes finally find love? 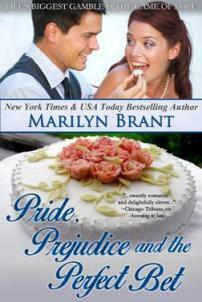 I hope you enjoy this excerpt of the book (copyright Marilyn Brant 2014)! Bingley McNamara stood near the altar of St. Andrew’s Presbyterian Church, right next to his cousin, Dr. William Darcy—the lucky groom on this lovely September Saturday. The two men watched as the maid of honor glided gracefully down the aisle, every step in time with the distinctive thrum of the pipe-organ music overhead. Jane Henderson, best friend of the bride, wore a silky, cocktail-length gown with a scoop neckline and some fun ruffly bits around the hem. Given the color her dress and her auburn hair, she was a vision in dark red. Appropriate, Bingley thought, since, when she spotted him, she shot him a look that was positively murderous. Damn. This was gonna be a helluva long ceremony. Bingley was well aware he was babbling but, man, his favorite cousin—his closest friend in all the world—was getting married in about three minutes. And though the bride was a genuinely wonderful woman and the soulmate his workaholic cousin desperately needed, Bingley knew he’d no longer be the go-to person in Will’s life after today. Aw, who was he kidding? He’d lost his elevated position months ago—the minute Will had laid eyes on Beth Ann Bennet. Will just shook his head and ignored the jabbering. Bingley sighed. Clearly, his cousin was only focused on his soon-to-be wife and was distracted by her beauty as she prepared to follow Jane down the aisle. The organ music changed to the stately “Wedding March” by Mendelssohn, and the entire three-hundred-member congregation stood to watch as Beth serenely made her way toward Will, accompanied by her father. Bingley, of course, was aware of Jane’s periodic glances in his direction—which could more accurately be described as piercing glares—but even she was finally paying more attention to her best friend than to him. Still, he couldn’t help but sneak a few more looks at the fiery maid of honor, remembering the way they’d first met four months ago, around the time Beth and Will became an official couple. So much polite chitchat followed. He’d been on his best behavior (Will’s orders) and, yet, couldn’t deny his immediate attraction to Beth’s dearest friend. But Jane had seemed so…nice, for want of a better word. Too sweet for him to want to tamper with or tease too much, although Beth hinted there was more to Jane than her pleasant veneer might suggest. He hadn’t believed that at first but, oh, he believed it now, as she swiveled to face her friend, sending another death stare in his direction, then a much kinder, warmer look to his cousin and, finally, winking at Beth’s seven-year-old son, Charlie, who was in the first pew. Charlie beamed a grin at her that infused his young face with delight, waved at Will and at him, too, and then squirmed to the edge of the pew so he could steal a few glances at his mom before she reached the altar. “You’re gonna be really happy, Cuz,” he whispered to Will, who was smiling at Beth as if he’d just won the lottery and it was being hand delivered to him in a pretty package of white tulle. Bingley exhaled and tried to stop his mind from playing the X-Ray Vision game every time he caught a glimpse of Jane standing demurely by the altar. Although, how could he keep himself from wondering if she had that leopard-spotted bra on underneath her red dress, like the one she’d been wearing in July, hmm? Or, why she had all but sprinted away from him when he saw her again a few days later, and why she’d studiously avoided him at the few other events they’d both had to attend since then… They’d barely made it past second base at the engagement party. Was she embarrassed? Had he unknowingly done something wrong? He knew from years of experience that he was better off not caring about what women thought of him. That keeping his emotions out of any relationship was the key. He sent the reverend an impatient look as the bride finally reached the altar and Jane took her sweet ole time fixing the train of Beth’s wedding gown. The reverend glanced at him with surprise, his cousin with a fresh round of bafflement. It Had to Be You~Harry Connick, Jr.
ALSO, check out this cute book trailer for the novel HERE, made by Heather, one of my wonderful readers! !